Today, high on a mountain, Jesus briefly draws back the veil of His humanity to reveal His bright glory to three of His amazed disciples. Why did He think they needed this? Today’s reading really requires attention to the context in which it appears (read Mk 8:31-9:1) to best understand it. We see that when Jesus “began to teach [the apostles] that the Son of man must suffer many things” (8:31a), Peter rebuked Him. Peter did not want to hear anything about a fate like this for Jesus, because suffering seemed to admit defeat and failure. This brought forth a stern rebuke from Jesus: “Get behind Me, Satan! For you are not on the side of God, but of men.” Jesus made it clear that Peter’s reaction to the fate that lay ahead for Him was earthbound. Satan always seeks to convince us we can have what we want without suffering the pain of self-denial. This kind of thinking presented such a threat to followers of Jesus that He turned to the whole multitude gathered there and said to them, “If any man would come after Me, let him deny himself and take up his cross and follow Me” (8:34). Sobering! However, Jesus also gave His followers great hope. He plainly told them, as St. Mark emphasizes, that in addition to His suffering and death, “after three days [He would] rise again” (see 8:31b). He spoke of His life beyond death, “when He comes in the glory of His Father with the holy angels” (see 8:38). Finally, He made an astounding promise: “Truly, truly I say to you, there are some standing here who will not taste death before they see the kingdom of God come with power” (see 9:1). Six days after this remarkable conversation, Jesus took three of His disciples, who would later become the pillars of His Church, “up a high mountain, apart by themselves.” This meant His words had time to sink in. When Peter objected to the idea of Jesus suffering, He was rebuked for thinking as men do. Now, Jesus led Peter, James, and John up, away from the world, for a spell. He was going to show them an alternative to the earthbound way of thinking. On top of the mountain, the disciples saw an extraordinary sight: “[Jesus] was transfigured before them…His garments became glistening, intensely white.” St. Matthew says in his Gospel that “His face shone like the sun” (see Mt 17:2). The disciples had never seen Jesus like this! In this dazzling moment, they had a glimpse of the glory that was His before He set it aside to do the Father’s will and become a man. So, this was the kind of glory to which Jesus had alluded when He spoke of His death and resurrection. His promise, that some listening to Him that day would live to see it, was already being fulfilled. Jesus was not alone in glory. Moses, the great law-giver, and Elijah, the fiery prophet, represented Israel’s covenant with God. They were the only two men who had ever spoken with God on top of a mountain. Jesus’ visit with them reveals something of great importance to us: the glory He had from the beginning, which He would have again in the “hour” of His Passion, to be fully revealed in His Resurrection, is shared with men. For us, of course, that requires transformation, not transfiguration. Jesus wasn’t transformed when He shone like the sun; He was simply making visible what had been invisible behind the veil of His flesh. For sinners, a transformation is necessary, and that is exactly why God sent His Son into the world on our behalf. As St. Paul wrote, “you have received the spirit of sonship…we are children of God, and if children, then heirs, heirs of God and fellow heirs with Christ, provided we suffer with Him in order that we may also be glorified with Him” (Rom 8:15b, 16b, 17). Peter impetuously suggested building three “tents” for Jesus, Moses, and Elijah. Whatever prompted this, St. Mark wants us to know that it came largely from Peter thinking he had to say something. How different he is from Mary, who preferred quiet pondering in the face of great mystery. Blessed John Paul II has written that the Church is Marian before she is Petrine. Wisdom! We can see now that the Transfiguration was a counterweight for the disciples to Jesus’ dark but necessary prediction of the suffering in His path. As they came down the mountain, Jesus told them not to talk about this event until after He had risen from the dead. Returning to earth from the heights of the mountain, the men were also returning to thinking as men do, “questioning what rising from the dead meant.” In due time, they would understand. When they did, they turned the world upside down with the Good News they glimpsed on the mountain that day. As St. Peter would later write, “For we did not follow cleverly devised myths when we made known to you the power and coming of our Lord Jesus Christ, but we were eyewitnesses of His majesty. For when He received honor and glory from God the Father, and the Voice was borne to Him by the Majestic Glory, ‘This is My Beloved Son, with whom I am well-pleased,’ we heard this Voice…for we were with Him” (see 2 Pet 1:16-18). For those of us still living through the mystery of glory on the far side of suffering, we can be comforted by what St. Peter next wrote: “You will do well to pay attention to this as a lamp shining in a dark place, until the day dawns and the morning star rises in your hearts” (see 2 Pet 1:19b). Possible response: Heavenly Father, I do want to pay attention to the glory that was revealed on Mt. Tabor. I need all the glimpses of glory I can get. There are many lessons packed into this familiar story of Abraham offering Isaac on Mt. Moriah. 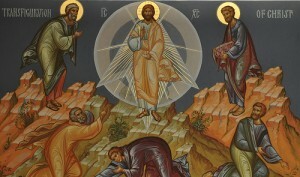 We are looking today for its connection with the Transfiguration. In the Gospel, we understood that Jesus wanted His disciples to know that the suffering He was about to experience came within the context of God’s love for Him. Jesus freely accepted His death out of obedience to His Father’s will. Today’s Old Testament story gives us an idea of what it is like for a father to offer his only son in the way God offered His only Son for us. See that God tells Abraham to “take your son, Isaac, your only one, whom you love” to Mt. Moriah to offer him up “as a holocaust.” This description of Isaac reminds us of how dear he was to Abraham. All God’s covenant promises rested on this boy, as did Abraham’s heart. God was asking everything of Abraham when He asked for Isaac. It was a severe test. Abraham obeyed. The poignancy and dramatic tension of this story are heightened by details not included in our reading. As Abraham and Isaac trek up the mountain, Isaac carries the wood for the altar fire on his back. He asks Abraham, “Where is the lamb for the burnt offering?” (vs 7) Can we imagine how that question seared Abraham’s soul? Whatever he had to choke back first, his answer declared his absolute faith in God: “God will provide Himself the lamb for a burnt offering, my son” (vs 8). We are given this moment in the story to ponder how hard it would be for a father to give up to death his only beloved son. We can feel it deeply in this drama, and we are greatly relieved when an angel stays Abraham’s hand. God sees that Abraham’s devotion to Him is complete. On that basis, He vows to keep His promise (“I swear by Myself”) to bless Abraham and “all the nations of the earth” through his descendants. This act of obedience, this willingness to hold nothing back, released a blessing of unimaginable scope. The foreshadowing of God, the Father, and Jesus, the Son, in this episode is unmistakable. Isaac is a type of Jesus, Who carried His own wood up the hill of Calvary and obediently submitted to His Father’s will. Abraham is a type of the Father, Who dearly loves His Beloved Son (“in Whom I am well-pleased”), yet Who gave Him up—for what? For love of us! In this ancient story, we can appreciate the deepest dimensions of God’s love on Mt. Tabor. He not only loves His Son, but He loves His fallen, wayward children, too. We are actually the ones who deserve death, yet, just as Abraham said, “God Himself will provide the lamb” Who takes our place instead. This is love beyond all telling, isn’t it? Possible response: Heavenly Father, I am thankful for this story of Abraham and Isaac. It teaches me something of what it cost You to let Jesus be killed for me. Possible response: Heavenly Father, help me remember that You are for me during this Lent, to resist sin because of Your love, not out of fear of losing it.